, an eminent physician, naturalist, and benefactor to learning, was born at Killileagh, in the county of Down, in Ireland, April 16, 1660. He was of Scotch extraction, but his father, Alexander Sloane, being at the head of that colony of Scots which king James I. settled in the north of Ireland, removed to that country, and was collector of the taxes for the county of Down, both before and after the Irish rebellion. He died in 1666. The younger years of sir Hans Sloane were marked by a strong attachment to the works of nature, in the contemplation of which he passed his leisure hours, until his studies of every kind were, in his sixteenth year, interrupted by a spitting of blood, which confined him to his room for three years. When, by strict regimen and abstinence, he had recovered, he studied the preliminary branches of physic in London, particularly chemistry, under Mr. Strafforth, an excellent chemist, who had been pupil to the celebrated Stahl. He also studied his favourite science of botany at Chelsea garden, which was then but just | established, and, young as he was, contracted during that time an acquaintance with Boyie and Ray. After four years thus employed, he visited France for improvement, in company with Mr. (afterwards sir) Tancred llobinson, M. D. (see his life, vol. XXVI.) and another student. At Paris he attended the lectures of Tournefort and Du Verney; and is supposed to have taken his degrees in medicine at Montpellierj some say at Orange. At Montpellier he was recommended by Tournefort to M. Chirac, then chancellor and professor of that university, and by his means to other learned men, particularly Magnol, whom he always accompanied in his botanical excursions, and derived much benefit from his instructions. He returned to London at the latter end of 1684, and immediately went to visit his illustrious friends Boyle and Ray. The latter was now retired and settled at Black Notley in Essex. Dr. Sloane sent him a great variety of plants and seeds, which Ray has described in his “Historia Plantartim,” with proper acknowledgments. 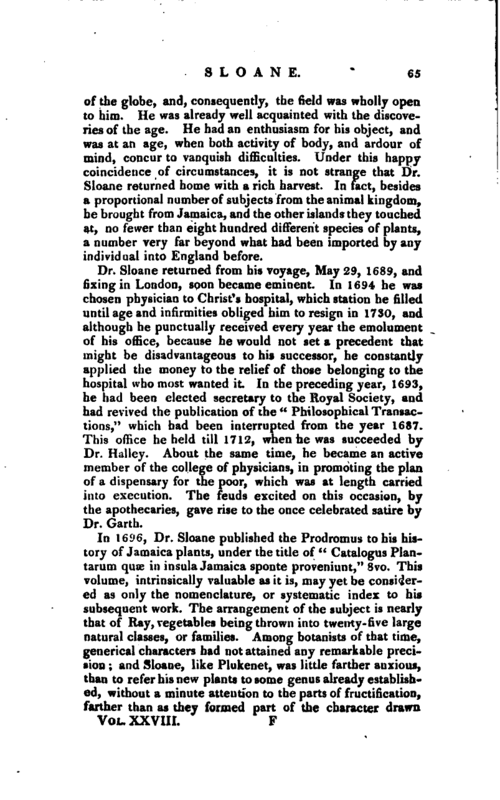 At London Dr. Sloane became the favourite of Dr. Sydenham, who took him into his house, and zealously promoted his interest in the way of practice. On Jan. 21, 1685, he was elected a fellow of the Royal Society, and in April 1687, entered into the college of physicians. Such early advancements in his profession are the strongest presumptions in favour of his superior knowledge, and promising abilities. Yet these flattering prospects he relinquished, to gratify his ardour for natural knowledge. On September 12, 1687, and in the twenty-eighth year of his age, he embarked for Jamaica, as physician to the duke of Alhemarle; and touched at Madeira, Barbadoes, Nevis, and Nt. Kitt’s. 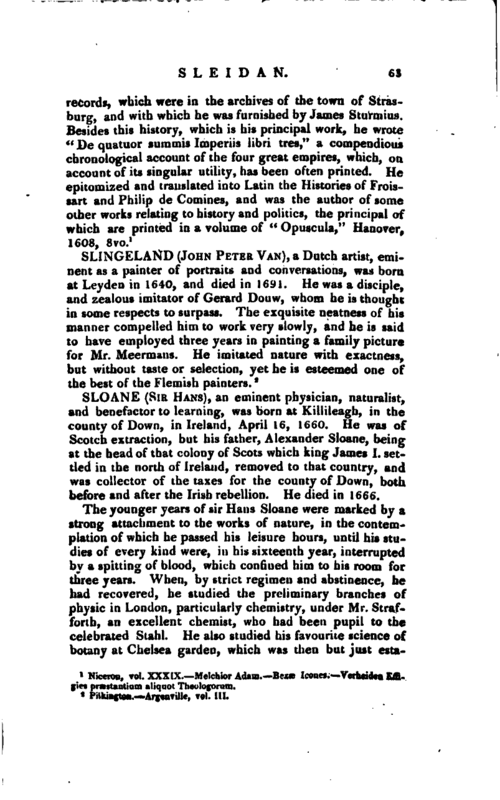 The duke dying Dec. 19th, soon after their arrival at Jamaica, Dr. Sleane’s stay on the island did noc exceed fifteen months. 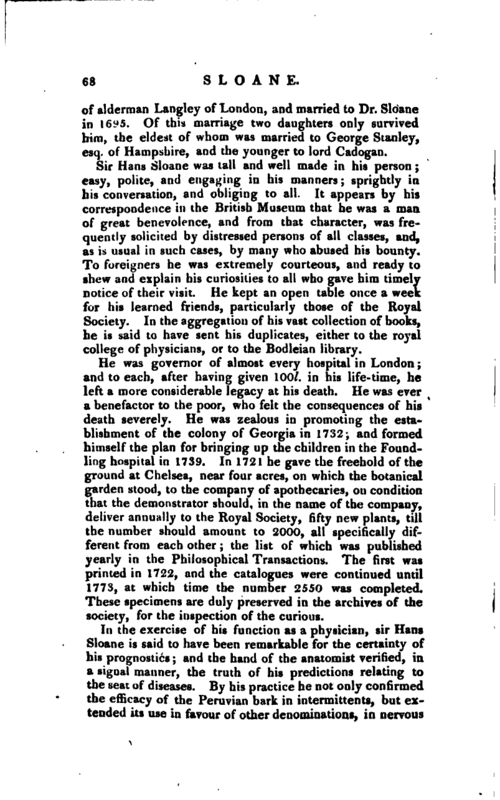 During this time, however, such was his application, that, in the language of his French eulogist, had he not converted, as it were, his minutes into hours, he could not have made those numerous acquisitions, which contributed so largely to extend the knowledge of nature; while they laid the foundation of his future fame and fortune. 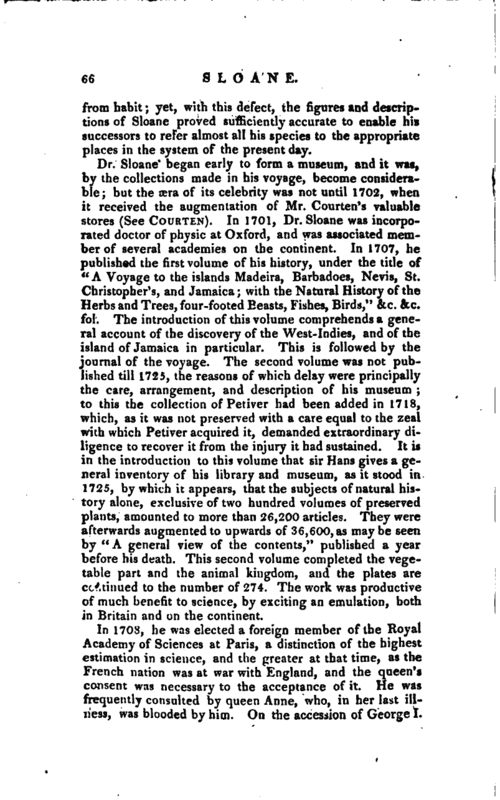 Dr. Pulteney remarks, that several circumstances concurred respecting Dr. Sloane’s voyage to Jamaica, which rendered it peculiarly successful to natural history. He was the first man of learning, whom the love of science alone had led from England, to that distant part | of the globe, and, consequently, the field was wholly open to him. He was already well acquainted with the discoveries of the age. He had an enthusiasm for his object, and was at an age, when both activity of body, and ardour of mind, concur to vanquish difficulties. Under this happy coincidence of circumstances, it is not strange that Dr. Sloane returned home with a rich harvest. In fact, besides a proportional number of subjects from the animal kingdom, he brought from Jamaica, and the other islands they touched at, no fewer than eight hundred different species pf plants, a number very far beyond what had been imported by any individual into England before. Dr. Sloane returned from his voyage, May 29, 1689, and fixing in London, soon became eminent. In 169-1 he was chosen physician to Christ’s hospital, which station he filled until age and infirmities obliged him to resign in 1730, and although he punctually received every year the emolument of his office, because he would not set a precedent that might be disadvantageous to his successor, he constantly applied the money to the relief of those belonging to the hospital who most wanted it. In the preceding year, 1693, he had been elected secretary to the Royal Society, and had revived the publication of the “Philosophical Transactions,” which had been interrupted from the year 1687. This office he held till 1712, when he was succeeded by Dr. Halley. About the same time, he became an active member of the college of physicians, in promoting the plan of a dispensary for the poor, which was at length carried into execution. The feuds excited on this occasion, by the apothecaries, gave rise to the once celebrated satire by Dr. Garth. In 1696, Dr. Sloane published the Prodromus to his history of Jamaica plants, under the title of “Catalogus Plantarum quae in insula Jamaica sponte proveniunt,” 8vo. This volume, intrinsically valuable as it is, may yet be considered as only the nomenclature, or systematic index to his subsequent work. The arrangement of the subject is nearly that of Ray, vegetables being thrown into twenty-five large natural classes, or families. Among botanists of that time, generical characters had not attained any remarkable precision; and Sloane, like Plukenet, was little farther anxious, than to refer his new plants to some genus already established, without a minute attention to the parts of fructification, farther than as they formed part pf the character drawn | from habit; yet, with this defect, the figures and descriptions of Sloane proved sufficiently accurate to enable his successors to refer almost all his species to the appropriate places in the system of the present clay. Dr. Sloane began early to form a museum, and it was, by the collections mnde in his voyage, become considerable; but the rera of its celebrity was not until 1702, when it received the augmentation of Mr. Courten’s valuable stores (See Courten). In 1701, Dr. Sloane was incorporated doctor of physic at Oxford, and was associated member of several academies on the continent. In 1707, he published the first volume of his history, under the title of “A Voyage to the islands Madeira, Barbadoes, Nevis, St. Christopher’s, and Jamaica; with the Natural History of the Herbs and Trees, four-footed Beasts, Fishes, Birds,” &c. &c. fol. The introduction of this volume comprehends a general account of the discovery of the West-Indies, and of the island of Jamaica in particular. This is followed by the journal of the voyage. 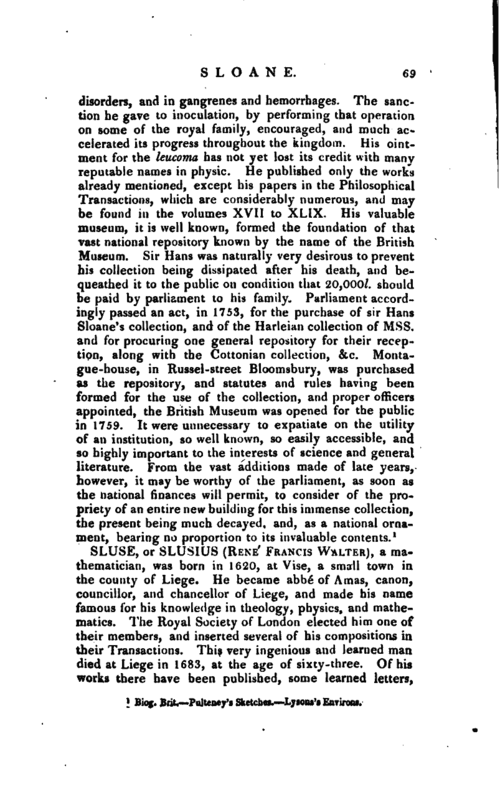 The second volume was not published till 1725, the reasons of which delay were principally the care, arrangement, and description of his museum; to this the collection of Petiver had been added in 1718, which, as it was not preserved with a care equal to the zeal with which Petiver acquired it, demanded extraordinary diligence to recover it from the injury it had sustained. It is in the introduction to this volume that sir Hans gives a general inventory of his library and museum, as it stood in 1725. by which it appears, that the subjects of natural history alone, exclusive of two hundred volumes of preserved plants, amounted to more than 26,200 articles. They were afterwards augmented to upwards of 36,600, as may be seen by “A general view of the contents,” published a year before his death. This second volume completed the vegetable part and the animal kingdom, and the plates are continued to the number of 274. The work was productive of much benefit to science, by exciting an emulation, both in Britain and on the continent. In 1708, he was elected a foreign member of the Royal Academy of Sciences at Paris, a distinction of the highest estimation in science, and the greater at that time, as the French nation was at war with England, and the queen’s consent was necessary to the acceptance of it. He was frequently consulted by queen Anne, who, in ber last illness, was blooded by him. On the accession of George I. 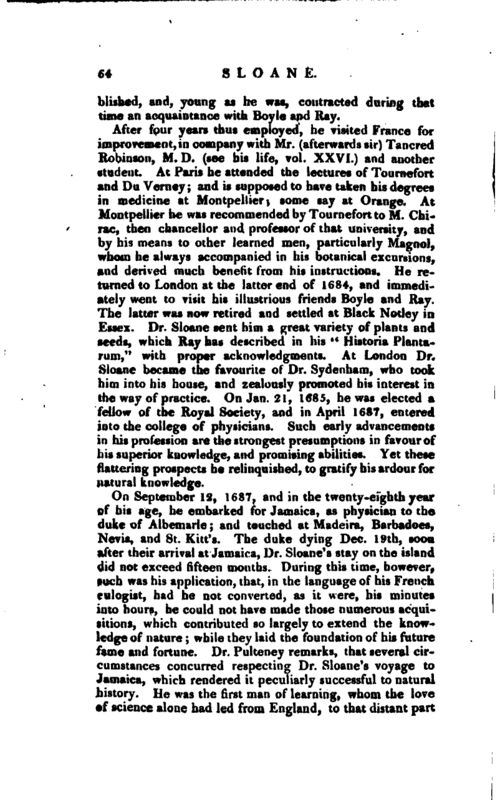 | he was created a baronet, being the first English physician on whom an hereditary title of honour had been conferred. He was appointed physician general to the army, which office he enjoyed till 1727, when he was made physician to George II. He also gained the confidence of queen Caroline, and prescribed for the royal family until his death. In 1719, sir Hans was elected president of the college of physicians, which station he held sixteen years, and during that time he gave signal proofs of his zeal for the interests of that body. On the death cf sir Isaac Newton, in 1727, he was advanced to the presidency of the Royal Society of London, the interest of which no man had ever more uniformly promoted. He made the society a present of 100 guineas and a bust of the founder, Charles II. 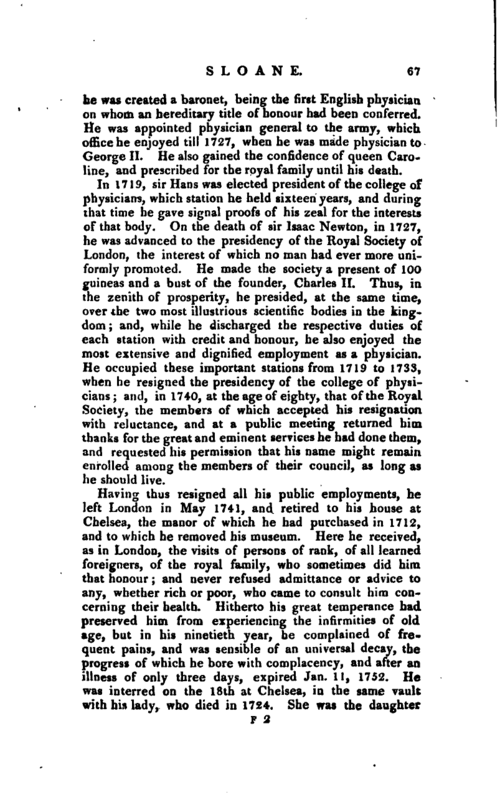 Thus, in, the zenith of prosperity, he presided, at the same time, over the two most illustrious scientific bodies in the kingdom; and, while he discharged the respective duties of each station with credit and honour, he also enjoyed the most extensive and dignified employment as a physician. He occupied these important stations from 1719 to 1733, when he resigned the presidency of the college of physicians; and, in 1740, at the age of eighty, that of the Royal Society, the members of which accepted his resignation with reluctance, and at a public meeting returned hira thanks for the great and eminent services he had done them, and requested his permission that his name might remain enrolled among the members of their council, as long as he should live. Having thus resigned all his public employments, he left London in May 1741, and retired to his house at Chelsea, the manor of which he had purchased in 1712, and to which he removed his museum. Here he received, as in London, the visits of persons of rank, of all learned foreigners, of the royal family, who sometimes did him. that honour; and never refused admittance or advice to any, whether rich or poor, who came to consult him concerning their health. Hitherto his great temperance had preserved him from experiencing the infirmities of old age, but in his ninetieth year, he complained of frequent "pains, and was sensible of an universal decay, the progress of which he bore with complacency, and after an illness of only three days, expired Jan. 11, 1752. He was interred on the 18th at Chelsea, in the same vault with his lady, who died in 1724. She was the daughter | of alderman Langley of London, and married to Dr. Sloane in 1695. Of this marriage two daughters only survived him, the eldest of whom was married to George Stanley, esq. of Hampshire, and the younger to lord Cadogan. Sir Hans Sloane was tall and well made in his person; easy, polite, and engaging in his manners; sprightly in his conversation, and obliging to all. It appears by his correspondence in the British Museum that he was a man. of great benevolence, and from that character, was frequently solicited by distressed persons of all classes, and, as is usual in such cases, by many who abused his bounty. To foreigners he was extremely courteous, and ready to shew and explain his curiosities to all who gave him timely notice' of their visit. He kept an open table once a week for his learned friends, particularly those of the Royal Society. In the aggregation of his vast collection of books, he is said to have sent his duplicates, either to the royal college of physicians, or to the Bodleian library. He was governor of almost every hospital in London; and to each, after having given 100l. in his life-time, he left a more considerable legacy at his death. He was ever a benefactor to the poor, who felt the consequences of his death severely. He was zealous in promoting the establishment of the colony of Georgia in 1732; and formed himself the plan for bringing up the children in the Foundling hospital in 1739. In 1721 he gave the freehold of the ground at Chelsea, near four acres, on which the botanical garden stood, to the company of apothecaries, on condition chat the demonstrator should, in the name of the company, deliver annually to the Royal Society, fifty new plants, till the number should amount to 2000, all specifically different from each other; the list of which was published yearly in the Philosophical Transactions. The first wa printed in 1722, and the catalogues were continued until 1773, at which time the number 2550 was completed. These specimens are duly preserved in the archives of the society, for the inspection of the curious. Biog. Brit. —Pulteney’s Sketches, Lysons Environs.